An effort is underway to protect and improve water quality in the almost one million acre Rum River Watershed. With its beginning at Lake Mille Lacs, most of the Rum River is a State Scenic and Recreational Waterway. The Rum is known for canoeing, smallbouth bass fishing, and high water quality. Many of the watershed's tributaries and lakes, including lakes George and East Twin, are also of high quality. The Rum River Watershed Restoration and Protection Project (WRAP) just began and it aims to protect all of this. Some lakes and streams in the watershed area are "impaired" and fail to meet state water quality standards. For these, a plan for improvement or Total Maximum Daily Load (TMDL) study will be completed. Special investigations of water quality problems (2014). Computer modeling to answer "what if" questions (2013-15). Total Maximum Daily Load (TMDL) planning (2015-16). A WRAP report that prescribes future management approaches (2015-16). After completion of the WRAP, local agencies will implement projects to protect and improve water quality. State funding, including the State Clean Water Fund from Clear Water, Land and Legacy Amendment, will ensure financial support exists for these projects. At the most local level, the Upper Rum River Watershed Management Organization (URRWMO) will be working for the Rum River and our lakes. The URRWMO is a joint powers organization of the Cities of Bethel, East Bethel, Ham Lake, Nowthen, Oak Grove, and St. Francis. Learn more at the Upper Rum River Watershed Management Organization. 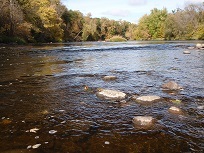 The WRAP is funded and overseen by the Minnesota Pollution Control Agency, and the Anoka Conservation District is the project lead. Nine other counties in the watershed are also involved. For more information on the Rum River WRAP project visit www.pca.state.mn.us and search for "Rum River WRAP." East Bethel also is part of the Sunrise River Watershed. The SRWMO is involved in many aspects of water management including planning and regulation, water quality, flooding, shoreland management, recreation, wildlife, and erosion control. For more information on what it is, meeting times and dates, and contact information on the SRWMO, visit the Sunrise River Watershed Management Organization.